The Bearcats basketball team had a thrilling come from behind victory over Eastern Kentucky University on Saturday night to improve to 9-2 overall. Unfortunately though the only people to see the late rally and win, by the Bearcats, were the roughly 7,000 fans in attendance as Fox Sports Ohio decided to cut away from the game with 1:20 left in regulation. FS Ohio cut away for a Columbus Bluejackets NHL game. As a result the thousands of TV viewers missed the late rally and last second alley-oop dunk (Vaughn to Gates) to tie the game and send it into overtime. The Bearcats controlled the extra session and won by eight, and it was a truly thrilling end to see in person. The many fans who missed the finish were none too happy and reportedly flooded FS Ohio's office with complaints and thoughts of the Heide Game in mind. My suggestion - show up to the games in person. Fifth Third Arena has a 13,176 capacity (filled only once this year). The average attendance is somewhere in the 6,000-7,000 range. As a result there are plenty of good seats available for a young team with lots of talent that is quickly rising in the polls. 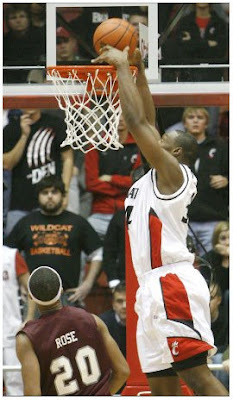 The Bearcats next home game is tomorrow night (12/22) at 7:30pm. UC will play host to Arkansas Pine Bluff in their last non-conference home game before Big East play begins. It is a crucial game that the Bearcats need to win. The Bearcats need to head into Big East play with a minimum of 10 wins and no bad losses. So far, so good as a win against Arkansas Pine Bluff would be win number 10 and the only two losses have come to Xavier and Florida State. If the Bearcats can then manage another 10 wins through the remainder of the season and get to the 20 win plateau then they'll be sitting pretty for a NCAA Tournament birth (see schedule/results here). FS Ohio has apologized for the mistake and claimed that it was an unfortunate technical error. During last night's airing of the UC vs. UAPB game they repeatedly made that known. They then replayed the second half and overtime of the UC vs. EKU game following the conclusion of the UC vs. UAPB game. The replay of the exciting finish I'm sure made a lot of people happy. Nice work FS Ohio.